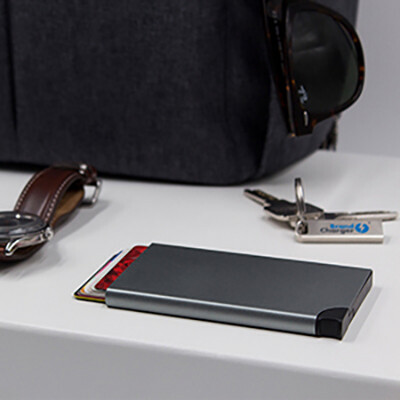 Features: Wally is a secure (credit) card holder for the minimalists. It offers room for up to 6 cards and has integrated RFID protection technology to keep your cards and personal information safe from RF readers or mobile apps capable of electronic theft. No more bending and breaking. With smart entry cards and digital payment technologies like Paywave, Apple Pay, Samsung Pay, Wechat Pay taken by storm, this is the only wallet you will need in the near future! Material: Aluminium.. Certification: RoHS. Product Colour: Graphite. Product Size: 106 x 63 x 9 mm. Print Area: 50 x 50 mm (laser), 95 x 53 mm (4CP). Print Process: Laser Engraved, 4CP Direct Digital. Delivery: 3-4 weeks (indent) from art approval. Standard Packaging: Black Craft Paper. Packing Details: 200 pcs per carton, 11.5 Kgs, 48x33x29 cms. Setups: Included.